Oops, sorry, didn't mean to start a slap fight there. From numerous hints and suggestions over the past few months to full-on disclosure. A new trailer for the co-op action adventure game Knack features a minute and a half of co-op gameplay. Thrill as silver Knack assists gold Knack by punching him in the back! A new trailer released by Sony shows handfuls of gameplay taken straight from Knack's unique co-op mode, all in full HD glory. Previously we only saw quick snatches from shaky cams that included Knack's remote play support using a PS4 and PS Vita. Now, we get to see how pretty this game is with a friend! Watch through to the end to see a quick smacking bout between the Knacks. Good to know co-op doesn't have to be 100% friendly. Knack may look all happy on the surface, but the run and jump action game presents quite a sturdy challenge. 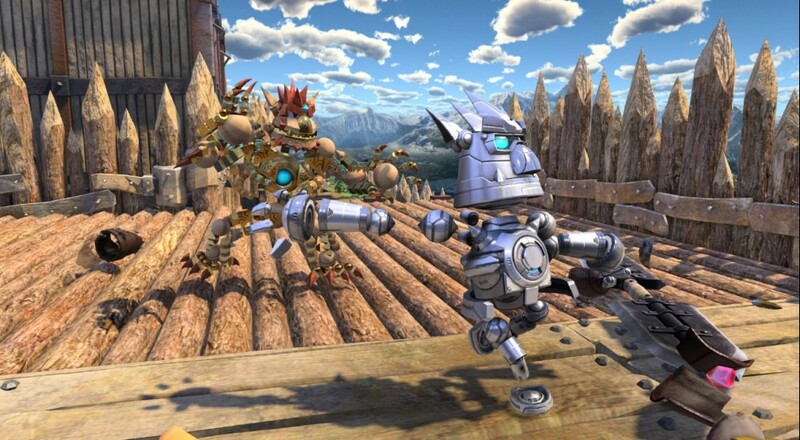 Two local players can pick up controllers and/or a Vita, the first operating regular, Gold Knack, and the second a special silver version of Knack. Silver Knack supports Gold Knack by picking up parts from the battlefield and donating them to keep Knack's health topped up. It was designed for families in mind, with parents helping their kids play through the campaign. Or, with the heavy difficulty, letting semi-experienced gamers feel like they aren't a failure.